After several requests, I have extended the range of individual premieres to occur at any point in 2019 (not just in the spring). Due to space and instrument limitations at the Old Whaling Church in Edgartown on Martha’s Vineyard, I will be delivering two versions of this piece - a version for choir and organ AND a version for choir and piano. Participating choirs may opt to use either. The final deadline to sign up is now December 31st, 2019. Delivery of the finished score will be in the second week of January, 2019. Conductor James Jordan and his Philadelphia-based choir The Same Stream will be active participants in this commission consortium project. - A consortium to commission a companion work to Benjamin Britten’s Rejoice in the Lamb, composed by Thomas LaVoy and of similar difficulty. - SATB with organ and solo(s), 15-20 minutes. - The commission fee is $500 per participating choir, payable to Thomas LaVoy on delivery of the work in the second week of January, 2019. - Premiere the work with your choir at any point in 2019. - To express interest or participate, fill out the form at the bottom of this page. - For further inquiries, please email me at thomasrosinlavoy@gmail.com. Further information about my trip to Martha’s Vineyard, including a visit to Nancy’s cabin and grave site, can be found here. In Autumn of 2017, I spent a great deal of time composing in a cozy music room in a West Philadelphia house, working diligently on a series of choral pieces for my upcoming anthology of simple SATB works. On the wall of this room was a peculiar piece of art featuring a woman flying through the air with chickens and bearing a caption that identified the woman as one Nancy Luce (I later learned that this piece of art was a linoleum-block print created by the gifted Martha's Vineyard artist Dan Waters). It wasn’t until my final week of working in that space that I began to research Ms. Luce’s life. I was fascinated and moved by what I found. Luce lived on Martha’s Vineyard in Massachusetts in the 1800s, her only true companions being the chickens that she loved dearly and cared for. In addition to sacred writings of her own styling, much of the poetry that she wrote from her little farm house concerned her feelings of grief at the loss of her favorite chickens and her hope for mankind to display more kindness to the “poor dumb beasts” of the earth. These poems are eccentric and at times even strange, much like their author – and Nancy knew it. She self-published small volumes of her writings and sold them out of a shop in her house, along with eggs and strange photos she had had taken of herself holding her chickens. Some have called her “the first female entrepreneur on the island” (Island Eccentric Clucked to Her Own Beat, The Vineyard Gazette), and by the time of her death she was able to afford a rather expensive headstone. Luce’s writing reminded me immediately of the poem Jubilate Agno by Christopher Smart, which was set masterfully by Benjamin Britten in his cantata Rejoice in the Lamb (1943). Smart composed the poem between 1759 and 1763 while confined for insanity in St. Luke’s Hospital, London. To be clear, this is not to say that I believe Nancy Luce was insane – she merely had a writing style that coincided in some strange way with Smart’s, at least in my mind. There is sorrow in both of their writings, as well as a feeling of being personally oppressed by other people, but both Smart and Luce had a particularly strong relationship with God, as well as an almost obsessive fascination with animals. 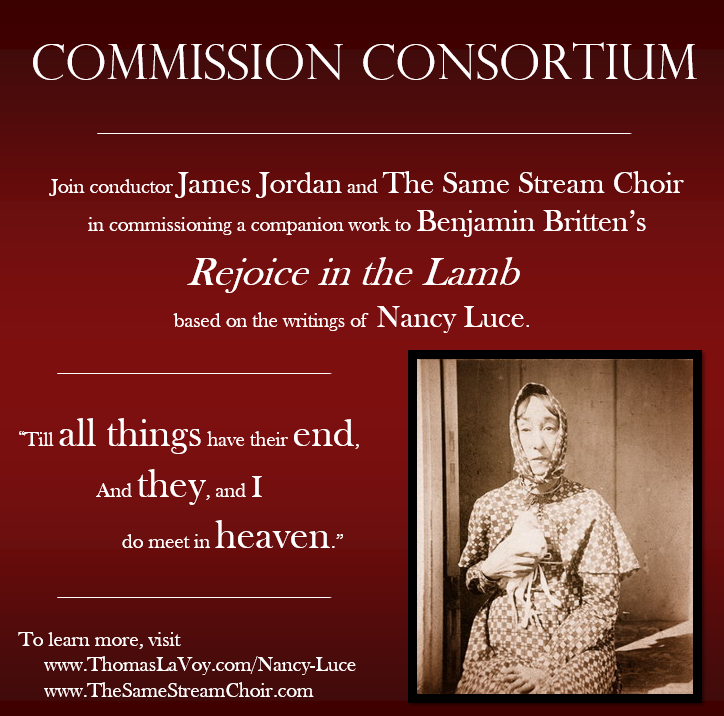 This commission consortium is meant to honor both the legacy of Britten’s Rejoice in the Lamb, which is one of my all time favorite choral works, and a relatively unsung folk hero of the Northeastern United States. While Nancy Luce’s story is well-known to most islanders living on Martha’s Vineyard, a cursory search on the internet will produce very few results regarding her life and work. This project aims to change that; to bring her fascinating story to the choral music community and to promote what I feel is the central pinion and message of her writing – to show kindness, both to our fellow humans and the animals that surround us. With the world the way it is now, I believe the simplicity of that message is something we desperately need.